It's the beginning of June and Drum Corps International units across the country are training hard for the upcoming summer tour. Meanwhile more than 4,000 miles away, the competitive action has already begun as Drum Corps Europe (DCE) celebrates its 10th anniversary and gets another action-packed season underway. The European Drum Corps Scene DCE sanctions drum corps events throughout Europe, managing the rules and regulations for each of those shows. DCE continues to grow each year as additional countries gain certification to host events. Just last week, Italy was approved for a "certified show," rounding out the 2010 DCE schedule to 15 events in five countries. So what is the drum corps activity like in Europe? For one thing, there's no age limit, and competition tends to stay local until the Championships. "We're all weekend drum corps," says Marcel Matthijsse, Chairman of DCE, explaining that corps will typically rehearse and compete in between work, school, or other activities. Not unlike the early days of American drum corps, European groups are generally based out of local communities where many youth are picking up instruments and equipment for the very first time. "In Europe, when you decide to be a member of a corps, that's where you learn to play," said Matthijsse. "We don't have music education at our schools the way it is in the States. [Students] can choose between playing soccer and playing an instrument…so there is a lot of competition between hobbies." Dutch corps Jubal at the '09 DCE European Championships. Growth and Change According to Matthijsse, only a few drum corps competed in Europe in the late 1990s. 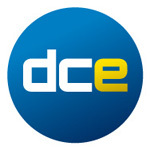 DCE was formed in 2000, with its first events held indoors in 2001. 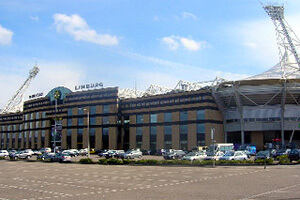 Matthijsse jokes that after hearing participating groups complain of "missing the smell of the grass on the field," the decision was made to move competitions outside for the 2003 season. Over time, Drum Corps Europe has developed its own set of rules and panels of adjudicators to provide consistent criteria with which to score its participating corps during competitions. After just a few years, there are now groups representing DCE from France, Germany, the Netherlands, Belgium, and the U.K., just to name a few. From Africa to Colombia to Japan and beyond, marching activities are taking hold in countries outside of Europe as well. A recent news story told of Malaysia's World Band Competition (WBC) becoming a "licensed partner" of DCE, which means that the organization has been approved to utilize DCE rules within its own competitive circuit. Malaysia's WBC is the first non-European organization approved to use DCE's rules manual. "We were looking for a judging system which would assess the performance of the bands objectively and independently," said Dato' Zulkifli Ishak, CEO of the WBC. He hopes the DCE system will help increase the quality of marching bands and the number of competitions in Malaysia and parts of Asia. Like Drum Corps International, DCE takes time each year to evaluate its rules, holding a conference to discuss any issues or updates that might need to be made. Matthijsse said the judging manual was changed in the last five months, and DCE will soon announce an update on rules regarding electronics. Setting the Stage for 2010 2010 DCE shows kicked off on May 22 with a Drum Corps Netherlands event in Middleburg as the season opener. 2009 DCE Champion Jubal, a group that made a trip to the Drum Corps International World Championships back in 2006, took top honors in the first step in its journey to defend last year's title. Other contests will take place through the summer months in the Netherlands, Ireland, the United Kingdom, Germany and Italy, before the season concludes with the largest event of the season on Sept. 25 at the DCE European Championships. The one-day event, which will feature 22 corps, will once again take place in Kerkrade, the Netherlands at Parkstad Limburg Stadium. "We have a great venue over there," Matthijsse says. "There's a lot of support from the local town, and it's just a great place to be." View the complete 2010 DCE schedule at DrumCorpsEurope.org.